When you find the bracket you are looking for you will have two options: The first is to "print", which will load and print the bracket as you see it with the standard title. You can see this in the image below(left side). The second option is to "Customize this Bracket", which allows you to quickly edit the title of the bracket before printing. You can see this in the other image below. 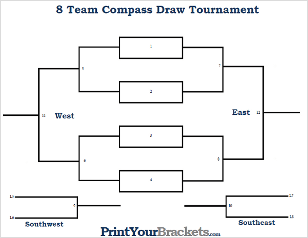 What is a Compass Draw Tournament? 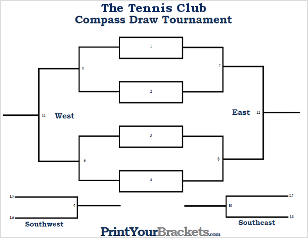 A compass draw tournament is popular amongst sports such as tennis and pickleball, but really is a very interesting tournament format that can be used for any sport. These tournaments work best with 8, 16, 32, or 64 players/teams. The are various brackets on each draw sheet that are marked by points on a compass(East, West, North, South, Northeast, Northwest, Southeast, Southwest). When a team loses they are moved to a different bracket, winners always just advance in their current bracket. All of our brackets have the games numbered in the order they are to be played and also list the exact location on the bracket where the losing team should move in the bracket. The first round of the tournament has team names listed down the middle column. The winners of the first round move to the right or the East Bracket, the losers move to the left or the West Bracket. The losers in the second round from the East Bracket move up to the North Bracket and the the losers of the West Bracket drop down to the South Bracket. The winners just move over in the current bracket. The movement above refers to the 16 and 32 player bracket, for an 8 player bracket the losers from the East drop down to the Southeast Bracket and the losers from the West drop down to the Southwest bracket. For 16 and 32 teams: At the end of round 3, the losers of the West drop down to the Southwest Bracket and the losers from the East will move up to the Southeast Bracket. The losers of the South Bracket will move over to the Southeast and the losers of the North Bracket will move over to the Northwest Bracket. At the end of round 4 of a 16 person bracket, the winner of each game is the winner of that particular bracket. In a 32 player bracket, all losers are eliminated and the winners of each game advance to the finals of each bracket.